Image caption Raila Odinga arrived at a rally on Sunday to chants of "no peace"
Kenya's opposition leader has urged people to stay away from work on Monday over the disputed election result. Raila Odinga said it would be a "day of mourning for the fallen patriots" after a rally in Kibera, the largest slum in the capital Nairobi. 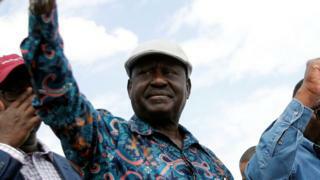 The international community has urged calm following the election, which Mr Odinga alleges was fixed. But after Mr Odinga spoke on Sunday, renewed violence broke out between his supporters and their opponents. Police fired tear gas in Mathare - a slum where Mr Odinga met the family of a nine-year-old girl shot by a stray bullet. AFP is reporting at least 16 people were killed between Friday evening and Saturday night. The Kenya National Commission on Human Rights said on Saturday 24 people had been shot dead during protests since election day on 8 August. It is unclear how much these two figures overlap. In a tweet sent after the rally, Mr Odinga said they had died at the hands of "Jubilee mandated death squads", referring to Mr Kenyata's party. 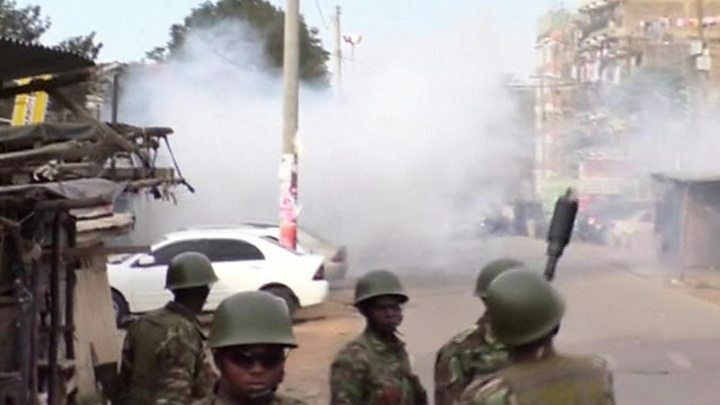 A man was also killed in Kisumu county, an opposition stronghold and the centre of post-election ethnic violence in 2007, when 1,200 people died and 600,000 were displaced. "This is a failed regime that is resorting to killing people instead of addressing the real issue. The vote was stolen. There's no secret about that," Mr Odinga told the 4,000 people who had gathered to hear him talk on Sunday. The official results gave President Uhuru Kenyatta 54.3%, and Mr Odinga 44.7%. He added: "We had predicted they will steal the election and that's what happened. We are not done yet. We will not give up. Wait for the next course of action which I will announce the day after tomorrow. "But for now I want to tell you not to go to work tomorrow (Monday)." The BBC's reporter in Nairobi said his claims were contrary to reports from both local and international observers that the poll was free and fair. European Union foreign affairs chief Federica Mogherini and former UN Secretary General Kofi Annan are among those who have urged Mr Odinga to seek redress through the courts - something the opposition coalition says is not an option. The Elections Observation Group (Elog), which had 8,300 observers, said its projected outcome put Mr Kenyatta on 54%, just short of the official figure of 54.3%.